Want to learn how to embed a live video stream from a security camera on your website? 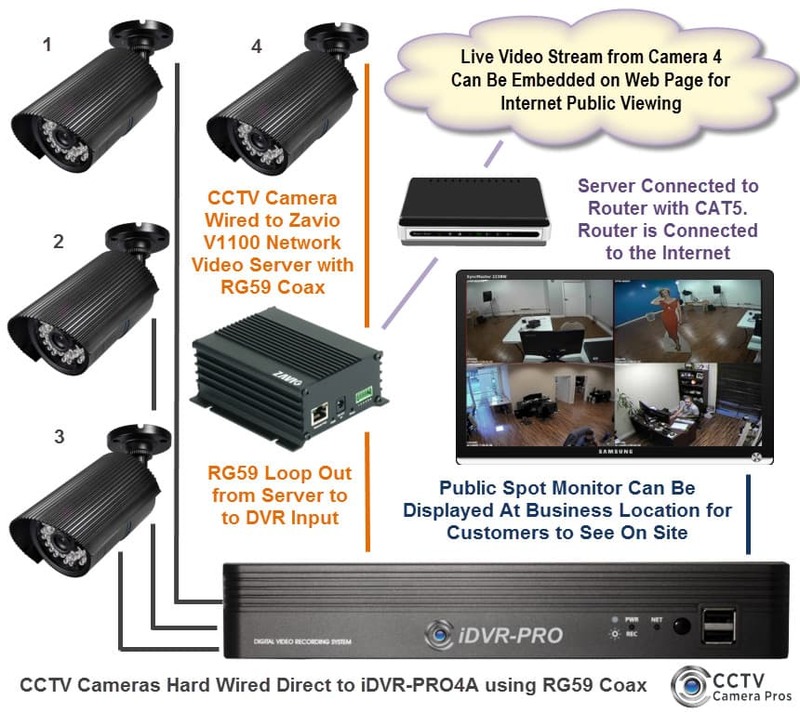 This article documents one way to do it using an analog CCTV camera and network video server. I documented this setup based on my recent experience with a prospective business customer. Here is a live view of a security camera installed. This camera is embedded into this web page is using the same setup that I recommended to the customer that I spoke to. This website uses a responsive website design which means that the HTML used to embed the video works on desktop, tablet, and mobile web browsers and adjusts in size according to the screen size and resolution of the device. In plain English, the live video and all other elements of the page will look good on desktop and mobile browsers. Here is a diagram of the of the system setup. I suggested that she replace her existing DVR with a 4 channel iDVR-PRO4A and that she add a Zavio V1100 network video server so that she can enable video streaming for one camera using HTML.